FlightAware Raspberry Pi + ADS-B PRO USB Stick + Band-pass SMA Filter + Car Antenna PiAware Track Planes by FlightAware at Mountain Walk. Hurry! Limited time offer. Offer valid only while supplies last. Includes: 1 (One) (One) Raspberry Pi 3 Model B + ADS-B 1090MHz FlightAware PRO USB Stick + Band-pass SMA Filter plus Car Antenna for FlightAware. Includes: 1 (One) (One) Raspberry Pi 3 Model B + ADS-B 1090MHz FlightAware PRO USB Stick + Band-pass SMA Filter plus Car Antenna for FlightAware. 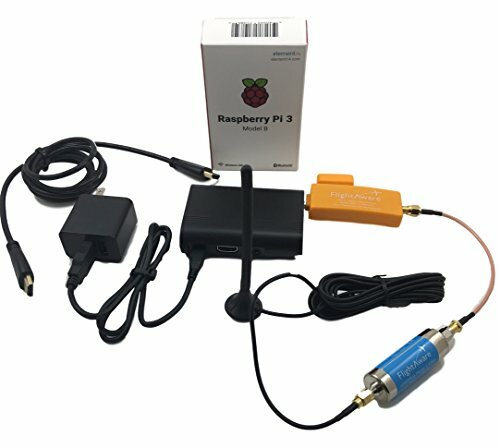 This is a perfect Car/Truck kit for your FlighAware dongle. SMA (female to male) 1090MHz Mode S filter. Designed to reduce interference and significantly improve valid mesage rate of ADS-B/Mode S receivers. Passes range 980MHz - 1150MHz. Impedance is 50ohms and insertion loss is <2.5dB. Raspberry 3 Model B Comes with pre loaded micoSD card with PiAware, all you have to do is Claim your device and you are ready (must register an account with FlightAware, internet connection is required). You can claim your device using provided Cat5 cable or you can enable WiFi (keyboard and mouse will be required - NOT INCLUDED). 1 - Raspberry 3 Model B with pre loaded microSD card ready for use! 1 - 2dbi Antenna with magnet base (comes with almost 10 foot of cable). If you have any questions about this product by FlightAware, contact us by completing and submitting the form below. If you are looking for a specif part number, please include it with your message.